Cats have been around for a very long time and they have accepted us as their friends. For thousands of years, the beautiful cat-human relationship has been ongoing, and in the times we are living in, it seems to be at its peak. Millions of people around the world have feline friends in their house and enjoy every minute spent with them. And it is a fact that cats are unique animals that have a soothing presence, and might even provide health benefits for people with certain conditions. It doesn’t come as a surprise that the Japanese see cats as sacred animals. With this in mind, there are hundreds of different breeds you can choose from, but one that is quite unique is the European Burmese cat. With its diverse history and attractive looks, this breed is becoming more popular by the year. How much does a European Burmese Cat cost? Talking about the personality of this breed, we can give you nothing but positive words. European Burmese cats are one of the most social breeds, and they will get along with anyone – whether it is you, your guests, your children, or your canine friend. European Burmese cats love hanging out in any kind of social situation and will prove to be an excellent companion. Still, know that they are highly intelligent and ready to trick you when something is not up to their preference. An affectionate and a friendly breed, they are perfect for one owner or for a family with kids. While the name European Burmese might imply that it originated from the foreign Burmese breed, that is not true. In fact, the European Burmese breed is a result of crossbreeding between British Shorthairs and regular Persian cats. The breed itself has been around for a few decades, yet millions of people have grown fond of it very quickly. The original Burmese breed has Siamese and copper Burmese cat as ancestors. After decades of breeding, the original Burmese breed became quite popular in Great Britain and was first registered in 1936, only to be restricted in 1947 (as breeders were crossing purebred Burmese with Siamese cats). It was restored again in 1953 and has since then maintained its popularity. On the other hand, the European Burmese cat is a somewhat newer breed and has inherited both the Siamese and British Shorthair traits. Starting off with its size, European Burmese cats are considered to be in the medium range, weighing anywhere from 6 to 10 pounds. Somewhat similar to a Siamese cat, it has a slim and toned body, with defined muscular and dense bone structure. 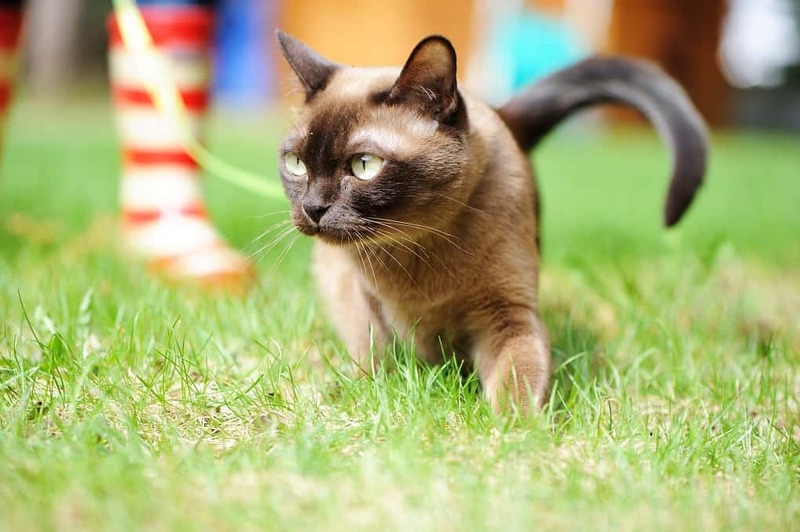 Such a body allows this breed to have an excellent athletic performance, as European Burmese cats are one of the better climbers and jumpers in the feline world. European Burmese cats don’t have almond-shaped eyes like its Siamese ancestor – on the contrary, it has round eyes that come either in an amber-gold or yellow. The eyes have a slightly curved line at the top and perfectly accent the shape of the face. This breed comes in only one point pattern but has a variation of ten different colors: lilac, brown, chocolate, lilac, blue, chocolate-tortie, brown-tortie, lilac-tortie, blue-tortie, red, and cream. 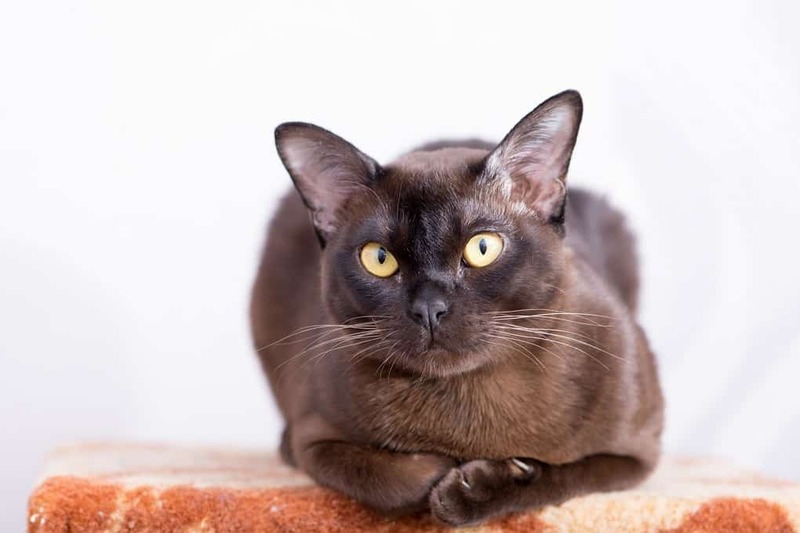 A European Burmese with yellow eyes and a chocolate-tortie color has a sweet yet taunting look that is considered as ideal. Given its coat, a European Burmese is shorthaired and it doesn’t have any undercoat. The hair is pleasant and silky to the touch, and European Burmese cats enjoy being brushed and groomed. They are highly sociable and love any time spent with humans. Apart from comb brushing once a week, a European Burmese doesn’t ask for a lot of other maintenance care. Of course, you shouldn’t forget to do regular teeth brushing to prevent periodontal disease. Nail trimming and ear cleaning should be exercised a few times a month as well. And as European Burmese cats don’t have a typical cat odor, you will not have to worry about bathing your European Burmese cat. European Burmese cats can live up to 15 years and sometimes even above that when properly nurtured and fed. On the other hand, due to a history of inbreeding conditions, European Burmese cats are likely to develop certain hereditary conditions such as retinal atrophy, kidney disease, or HCM. Most of these conditions can be detected and identified before they become life-threatening. With this in mind, you should get performed screenings from your breeder, as well as ask for a health certificate that will prove that they are not part of an inbred line. 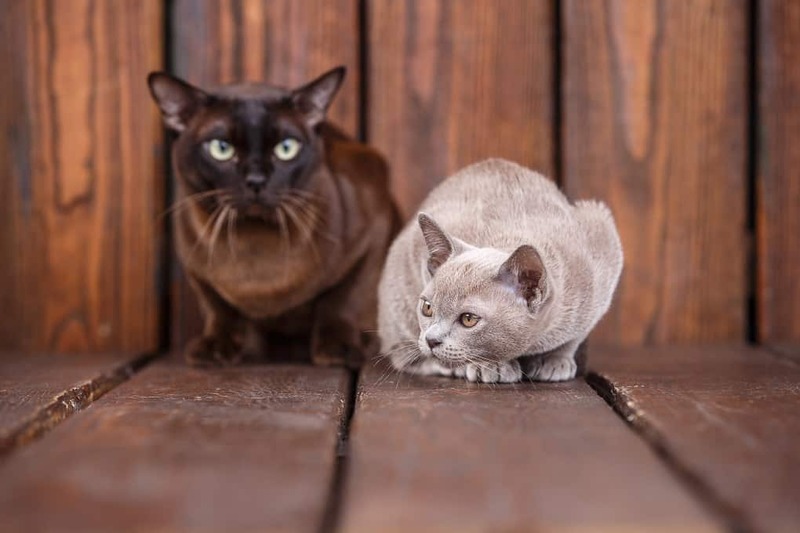 While European Burmese cats are a somewhat newer breed, they are not rare, and if you are living in the UK or the USA, you might find a good breeder in your area. We always recommend the option of looking for online breeders – while it may end up being somewhat more expensive, it is worth it as more reputable breeders have a strong online presence and highlighted feedback. Last but not least, while the European Burmese is just becoming popular, there are already a number of these cats in cat shelters which means that you can save yourself money and time, and adopt a loving feline friend. One of the main reasons why the European Burmese cat has been becoming so popular is due to its low price matched with its attractive looks. A European Burmese cat will cost you somewhere between $200 and $300, which is much lower than the price of a Siamese, Persian, or Angora cat. Along with that, you always have an option to do a good deed and adopt one for even less. There is not much to choosing the right European Burmese cat other than looking at certain physical traits. Along with that, you should always check on the breeder and be sure that it has a reputable history. Breeders that inbreed should be banned from the business, but as they are not, it is your job to find out a trusted one. When it comes to identifying this cat, you should first check if the color falls under the recognized ACFA standard. As we have mentioned above, the European Burmese comes in only one pattern, but might have ten different color variations. Apart from that, you should be looking at a triangular face with round yellow/amber eyes, and a proportional tail. A European Burmese cat has a silky coat and an elegant muscular body that is somewhat similar to that of a Siamese cat. Of course, you should always ask for a health guarantee and proof of performed tests to ensure that your cat is safe from any hereditary conditions. We can safely say that this cat breed is the one that comes with very few responsibilities. This doesn’t mean that you should leave them alone in the house with no attention whatsoever – on the contrary, you should socialize with them in any given moment. Due to its physical traits, grooming will not be a problem, and the cat will perform most of it alone. Still, you should comb them a few times a week just for fun and improving circulation. Along with that, while they like to play, they are happy to be by your side even when you aren’t able to invest time (you are preparing a meal, etc.). Being highly sociable and affectionate, European Burmese cats are perfect for an indoor environment. What this means is that you should provide them the right conditions to be happy and healthy without having to roam out on the streets. Outdoors shouldn’t be an option unless you have a fenced backyard. Why? Because your European Burmese cat will be at risk of catching numerous diseases, getting lost, or killed or harmed by other animals. It is your responsibility to make your household a fun place for your cat to live in. As we have mentioned above, out of all cat breeds, the European Burmese seems to have a special place on the friendliness list. This breed is sociable and enjoys any kind of social interaction or situation. They will follow you around the house no matter what kind of task you will be performing. As they are a highly intelligent breed, they will try to effectively interact with you, and let you know when they feel unsatisfied. European Burmese cats are quite vocal which means that it might not be the best choice for those of you that can’t stand too much noise. On the other hand, they are among the best breeds for a household with children, as a European Burmese enjoys socializing with small humans. Plus, your worries about how your dog and cat will get along? Those times are long gone as European Burmese cats are extremely tolerant towards any other animals. Talking about different types of European Burmese, we can once again remind you that these come in only one pattern and that is point. There is a variation of ten different colors that do come as an option: lilac, brown, chocolate, lilac, blue, chocolate-tortie, brown-tortie, lilac-tortie, blue-tortie, red, and cream. The chocolate-tortie is considered to be the most elegant and attractive out all European Burmese types. Although a European Burmese does have a unique look, it still resembles the breeds from which it originates. This means that both a Siamese Cat and a British Shorthair are quite similar to the European Burmese cat, both in the physical and personality traits. If you are looking for a medium-sized cat that will be great with strangers, children, and other animals, the European Burmese is a perfect choice. Intelligent, playful, and affectionate, it will be your family’s friend no matter what.